Submitted by Jordan Walsh on Sat, 2015-11-14 10:15. You would have to ask Autodesk to fix this up, then Modifier Zorb should pick it up automatically. Submitted by mindmedicine on Tue, 2015-11-10 03:34.
of an object, none of the properties show up. Thanks for this great script. Just started using it, but I can already see it will be very helpfull! Submitted by Jordan Walsh on Thu, 2015-07-16 01:41. Is it the same error? I would need some more detail to be able to fix it, perhaps it is easier if you send me a cutdown scene file to test with? Submitted by cecofuli on Wed, 2015-07-15 05:58. Submitted by Jordan Walsh on Sat, 2015-07-04 10:31. I have tried with Corona v1.1.1 and all seems fine (My test version would be a bit new though!). I found a bug on the falloff map that is fixed in 2.8.01. Give that a try and let me know if there are any other errors. Submitted by cecofuli on Tue, 2015-06-23 11:21. Hello, Mayne because the new verion of Corona (v1.1.1) But, now, I have an error with CoronaNormal and, also, we need the supoprt for the new CoronaBitmap. Thanks. Submitted by Jordan Walsh on Tue, 2015-05-05 05:21. I think the features that you are requesting will be a bit painful to add as I don't have heaps of time to work on it at the moment. What I can add is the ability to modify the Exclude Modifier search string from "ExcMod" to what ever you want. Would that help? 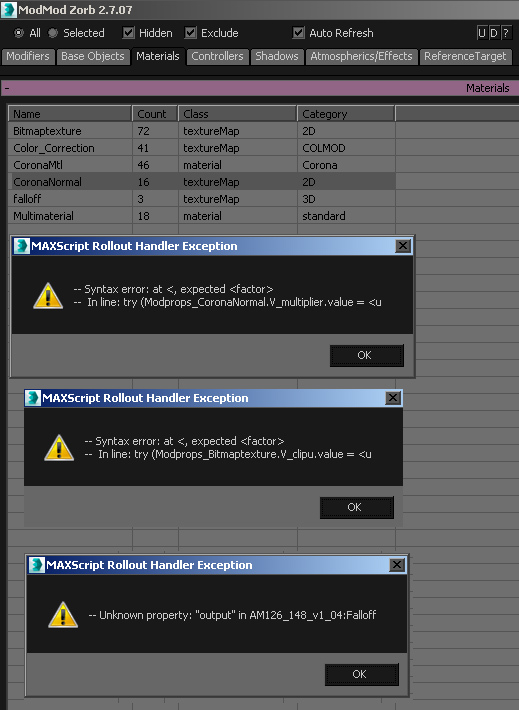 Also the best mass modifier renaming tool would be to do a simple maxscript loop. A tool wouldnt give you the flexibility learning a bit of maxscript would give you. Submitted by kirillall on Sun, 2015-05-03 06:15. What do you think about this features in ModifierZorb and how many pain to add them? Thank you. Submitted by Jordan Walsh on Fri, 2015-05-01 03:09. Submitted by kirillall on Wed, 2015-04-29 06:28. Hello Jordan. Current zorb take 2 same modifiers in stack (also with different names) and control them as one. Can you please add ability to split same modifiers in stack and control them as different. (split by name, split by stack order) - this feature will be very useful. Thank you.